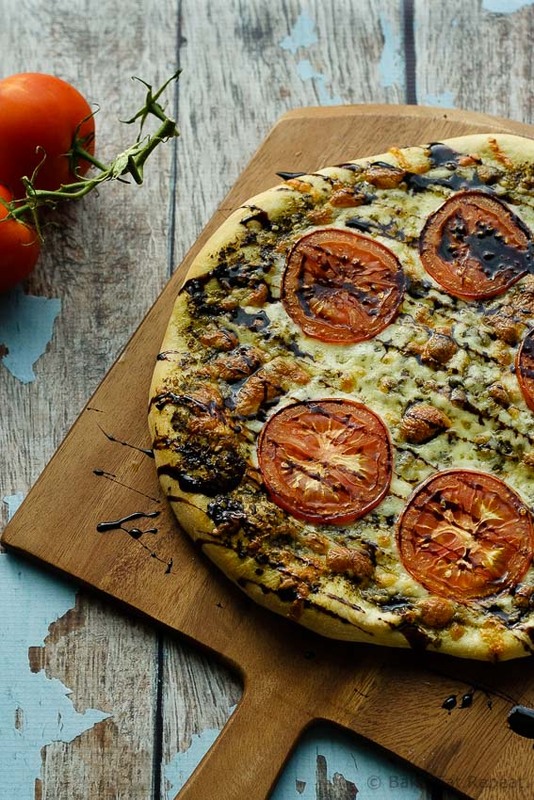 Quick and easy caprese pizza with pesto, mozzarella and tomatoes, and drizzled with balsamic glaze. Perfect for pizza night! So after finally sharing my favourite pizza dough recipe, and rambling about how much I love pizza, I definitely needed to share my current favourite kind of pizza. I say current because it changes pretty regularly, but right now I can’t get enough of this caprese pizza. The kids won’t eat it, but that almost makes it better – more for me! It’s a fairly simple pizza. Not even really a recipe. But still, it’s so good that I couldn’t help but share! Instead of the usual tomato based pizza sauce, this one uses pesto. Then it’s covered in mozzarella and tomato slices and baked until bubbly and golden. Drizzle with balsamic glaze and serve. And then make more. That’s it. So, so simple, but sometimes those recipes are the best right? The ones you can whip up in a matter of minutes but can’t get enough of? This is that kind of recipe. Amazing pizza that you will definitely want to try sometime soon. Hopefully with this pizza dough, because it really is the best! Preheat the oven to 500 degrees F, and place a pizza stone or upside down cookie sheet in the oven to heat up. Stretch the pizza dough out into a large 14 inch circle (or two thinner 12 inch circles). Place it on a piece of parchment paper. Brush the olive oil all over the dough and sprinkle with garlic salt. Spread the pesto over top of the pizza, leaving a half inch rim around the edge. Spread the mozzarella and parmesan cheeses over top of the pesto. Spread the tomato slices over top of the cheese. Slide the parchment paper with the prepared pizza onto the hot stone and bake for 10-12 minutes (7-10 minutes if thin crust) or until lightly browned and the cheese is bubbling. Remove from the oven onto a cutting board and let it cool for 5 minutes before slicing to allow the cheese to set. 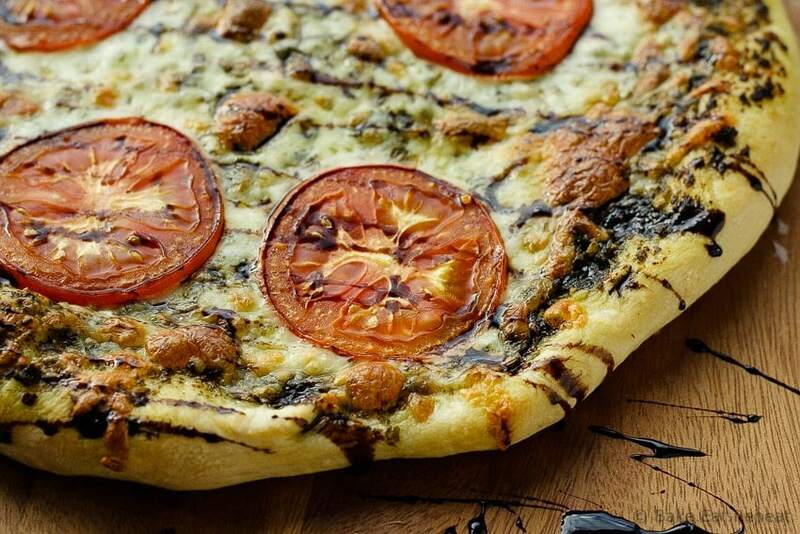 Drizzle the balsamic glaze over top of the baked pizza, slice and serve. I generally make thin crust pizza with this pizza dough, but decided to try it as a thicker crusted large pizza for this one. It was very good, but we do prefer the thin crusted variety. This dough works well either way so make your preference. I made the Caprese pizza this past weekend and it is delicious! What a great way to use your pizza dough! I love caprese anything, so this sounds perfect! This is such a fun idea! And yes, simple is ALWAYS better! Happy New Year Stacey! I am totally craving comfort food today, and this pizza looks like it would hit the spot! Looks delicious. Happy New Year! This looks amazing- my favorite pizza is margherita, because of the caprese components, but this is next level with the pesto and balsamic! Love it!